JEFFERSON - Lucas Redd clinched his fists in frustration as he took his linebacker spot in the Dragons' defense for the last time Friday night. The senior's consternation stemmed from a missed opportunity at the end of a long season. The No. 7 Dragons threatened late in their second-round game against defending state champ Buford in the second round of the Class AA playoffs, but a turnover helped the Wolves clinch a 30-22 win and a ticket to the state quarterfinals. "It just happened so fast," Redd said. "They played well and came out on top. Something happens and it is all over. It can happen in a second." Buford will play Cook - which defeated Appling County 29-21 on Friday - next week in its 10th consecutive appearance in the quarterfinals. The last time the Wolves failed to get past the second round was 1999. The Dragons have not reached the quarterfinals since 1977, when they went to the state finals. Jefferson ends its season at 11-1 for the second consecutive year. "We knew it was going to be a tough game, but we had a chance," Jefferson coach T. McFerrin said. "I don't know how many people actually gave us a chance, but our players know we had a chance." Following a 50-yard touchdown pass from quarterback Darius Minor to J.J. Damons to pull the Dragons within eight points of Buford, Jefferson recovered an onside kick with less than five minutes remaining. The Dragons were able to drive the ball inside Buford's 25-yard line, but on a second-and-1 play, the Dragons fumbled a handoff between Minor and Redd and the Wolves recovered. It was Jefferson's only turnover of the game, and the Dragons would not get the ball back until only 7 seconds remained. "It was just a miscommunication," Redd said. "I don't know. We messed up big time right there. That one is on me." 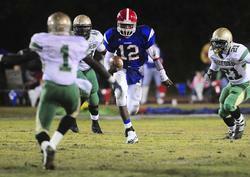 The Dragons' defense was pounded all night by Buford's punishing running attack. The Wolves finished the game with 255 rushing yards spread between seven different players. To start the second half, Buford took the ball 82 yards on 17 plays - 13 of which were running plays - for a score, eating up 9 minutes, 1 second of the third quarter. "That has happened to us the last three or four weeks," McFerrin said. "They did a great job. ... We couldn't get the ball away from them." Seon Jones led Buford's running game with 108 yards on 12 carries. The Dragons struggled to find any rhythm on offense in the second half, going three-and-out on their first two possessions as Buford expanded on its three-point halftime lead. Opting to avoid the Wolves' large defensive line and fast linebackers, McFerrin unleashed Minor's arm. The senior quarterback threw more in a single game than he has all season, completing 15 of 30 passes for 164 yards and two touchdowns. The Dragons rushed for just 96 yards against the Wolves. "They are just so big and strong inside," McFerrin said. "We had to go outside with the option and throwing the ball. We had some success doing that." The Dragons kept the game tight at halftime with a late touchdown pass from Minor to Tyler Porter. The two hooked up again on a two-point conversion attempt to make the halftime score 17-14 in Buford's favor. Jefferson did not reach the scoreboard until midway through the second quarter when Caleb Meek, known as "Speedy" to Jefferson fans, took an option pitch from Minor for 25 yards and a score. "They played with a lot of heart and courage, and we sure are proud of them," McFerrin said. "I just wish we had that fumble back. But that is just one of those things." Buford scored on all of its first-half possessions, except when it got the ball back with just seconds left in the half and took a knee. Wolves kicker David Petroni hit a 37-yard field goal in the first quarter for the first points of the game. The defending state champs also received a rushing touchdown from Eric Barr. The biggest blow to Jefferson in the first half came when the Dragons had the Wolves facing a third-and-9 at midfield. Jefferson's blitz nearly reached quarterback Alex Ross, but he recovered and found a wide-open Jessel Curry down the middle of the field for a 54-yard touchdown. JEFFERSON - Darius Minor put his team on his shoulders in Jefferson's Class AA state playoff opener with Heard County Friday, scoring with 2:04 left in the game to give the Dragons a 21-13 victory over Heard County and setting up a second round match-up with defending state champions Buford. They are a good team," Dragons' coach T. McFerrin said of the Braves (6-5). "I am so proud of how our guys fought and battled through the adversity." Jefferson's offense struggled the entire game without Lucas Redd, who was out with the flu. Jefferson had only three second-half possessions, and the second one was the biggest. Taking over with eight minutes to play, the Dragons' offense bled the clock to two minutes and scored to put the game away. Minor rushed in from 22 yards out to put the game out of reach. Minor led the Dragons' offense with 65 yards on 12 carries. "We made mistakes and beat ourselves," Minor said. "But when it came down late, we saw a play that could work and everything worked out." On defense, Chris Jackson stepped up for Redd, recording 14 tackles in the first half, including several pivotal stops in the backfield. Jackson finished the game with 22 tackles, and also added 28 yards rushing and 22 yards receiving. "With so many guys out, it was tough," McFerrin said. "Our guys just played with a lot of courage and heart." The Dragons' special teams came up with their biggest play of the game when Minor took a punt 68 yards for a touchdown to give the Dragons a 14-0 lead at the end of the first quarter. That score ended up being the difference. The Dragons' lone offensive score of the first half came on their second possession of the game when they went 78 yards with an eventual score by Zach Allen from 4 yards. Heard County gave Jefferson everything it could handle, led by quarterback Santez Emory, who ran 26 times for 123 yards and two scores. But perhaps more importantly, Emery and the Braves' offense were able to keep the ball out of Minor's hands. Jefferson ran just 40 plays, compared to 68 for Heard County. "We couldn't get them off the field," McFerrin said. "But we came up with a big play late,(and) that last drive was crucial." Jefferson's defense wore down as the game went on as Heard County recorded 56 rushing attempts for 223 yards. The Braves pulled to within one point with a score at 8:08 in the fourth quarter but missed the extra point. Emery dove for a yard on a fourth-and-goal from the 1-foot line. The win sets up the meeting with Buford that Minor has been looking forward to. Buford (10-1) is ranked third in Class AA while Jefferson (11-0) is ranked fourth. "I don't think they are a college team or anything," Minor said. "They are kids just like us. It comes down to who plays harder and smarter." JEFFERSON - First-year Jefferson coach T. McFerrin shifted uncomfortably on the sideline as thousands of Dragons fans behind him prepared to celebrate. McFerrin wasn't able to join the jubilation until his team took the field to kneel out the remaining seconds. The Dragons held off a late surge by rival East Jackson, beating the Eagles 35-21 in a jam-packed Memorial Stadium on Friday night in a battle between two unbeaten teams. The win gave Jefferson its second consecutive Region 8-AA championship and its second consecutive perfect regular season. Even up two scores with less than two minutes to play, McFerrin wasn't ready to celebrate his team's achievements. "They are just so explosive," McFerrin said of East Jackson. "I didn't feel comfortable until the last 30 seconds, after their last pass went incomplete." Jefferson will host the No. 4 seed from Region 5-AA next week in the first round of the playoffs. East Jackson, knocked down to the No. 2 seed with its first loss, will host its first playoff game next week against Region 5-AA's No. 3 seed. Although the Eagles' bid for their first region championship and perfect regular season fell a game short, coach Frank Caputo refused to say that his team was entering its first postseason on a low note. "We had nothing to lose out here tonight," Caputo said. "This is just our third year. They have been playing football since the 1940s. I don't think this is a sour end to the regular season. This doesn't take anything away from what our kids did this season." Jefferson had to survive a two-game stretch against its best two opponents - North Oconee and East Jackson - to end this regular season in much the same way they did last year. For quarterback Darius Minor, who led the Dragons to last year's region title and 10-0 record, repeating felt better. "I can't explain how I feel right now. I'm just so excited inside," Minor said. "I've been telling everyone it is like six times better than last year. It is like being handed a million bucks." Jefferson held a 28-7 lead midway through the third quarter and looked poised to run away with the title, but East Jackson put together two quick scoring drives, both of which ended on touchdown runs by Deon Sewell. He finished the game with 134 yards on 27 carries. With 2 minutes, 34 seconds left in the game however, J.J. Damons broke off a 54-yard touchdown run, his second of the game, on an option pitch from Minor to seal the victory. Having relied on the run for most of the season, Jefferson did its biggest damage through the air, using the arms of both Minor and fullback Lucas Redd. "We had to stretch them out," McFerrin said. "They run that 3-3-5 stack and that is so tough to run against. We thought we would have some success throwing the ball." Minor completed 8 of 10 passes for 183 yards and two touchdowns and Redd, who has not thrown a pass all season, completed 3 of 4 for 71 yards. On both of Minor's touchdown passes, his offensive line held a cautious East Jackson defense back, giving the quarterback plenty of space and time to throw. "I brag on my offensive line 24-7," Minor said. "They told me they weren't blitzing, so I could just take my time. If someone was coming, they would holler or something. They did a great job." The Dragons scored 21 points in the second quarter, starting early with a 24-yard touchdown run by Damons on an option pitch on the first play following the end of the first. East Jackson evened the score immediately with a 99-yard touchdown return by C.J. Allen. That would be the only points the Eagles would find in the first half. After going scoreless for the first 12 minutes, the two teams combined for 14 points in a 25-second span. The Eagles' best drive of the first half reached the Jefferson 25-yard line but ended when a pass from quarterback Evan Williamson was picked off by Jefferson's Kyle Mosley at the Dragons' 16-yard line. East Jackson's first drive featured three first downs but ended on a failed pass attempt on fourth down. The Eagles' offense did not score until late in the fourth quarter. "I think they put more people in the box than we anticipated," Caputo said. "That is just a tough football team. Their defense has been great all season." Minor threw his pair of touchdowns in the second quarter. The first was a 47-yard bomb to Tyler Porter and the second was a 30-yard bullet over the shoulder of Redd. BOGART - As Jefferson quarterback Darius Minor shook hands with the defeated Titans, he received some words of encouragement from Brandon Whitlock. "Go do it to East Jackson," the North Oconee running back said. With a 20-6 win over North Oconee at Titan Stadium on Friday, Jefferson set up an undefeated showdown with East Jackson for the Region 8-AA title next week in both teams' final regular season game. The Eagles also moved to 9-0 with a win over Dawson County on Friday night. The loss eliminated any shot for North Oconee to claim its first region championship and also denied the Titans the chance to host a first-round playoff game. Both Jefferson and East Jackson are guaranteed home playoff games in the first round. The Dragons knew a season finale against an undefeated East Jackson team was possible midway through the season, but did their best not to think about it Friday night. "It has been in the back of heads, but we knew we had to take care of North Oconee first," said fullback Lucas Redd, who led the Dragons in rushing with 73 yards and a touchdown on 14 carries. "We were wanting this outcome, 9-0 against 9-0 on senior night." Before the Dragons got to the game against the Eagles, they had to get past the Titans and the toughest defense in the region. North Oconee held Jefferson to its lowest offensive output of the year. The Dragons were averaging 378 yards of offense and 43 points per game heading into Friday's game. Against the Titans, Jefferson was held to 193 yards of offense and 20 points. After the game, Jefferson coach T. McFerrin finally gave his team permission to talk about East Jackson. "I knew it was going to be tough," McFerrin said. "They are a good defense, certainly the best team we've played all year. ... People in the school wanted to talk about (the game against East Jackson). I said that we needed to win this one first." Both teams combined for four turnovers in the first half, three of which led to 20 points. On North Oconee's first drive, Jefferson's Zach Allen knocked the ball loose from Titans running back Brandon Whitlock, and Chris Jackson returned the fumble 45 yards for the Dragons' first touchdown. Allen produced another fumble early in the second quarter on a quarterback sack. Jefferson recovered a fumbled pitch on the Titans' second possession on the North Oconee 30-yard line. Two plays later, Jefferson running back J.J. Damons broke several tackles for a 22-yard touchdown run, giving the Dragons a quick 14-0 lead. "That won the game for us," McFerrin said. "We had to have those turnovers. Our defense played just great tonight." After forcing North Oconee to punt late in the first quarter, Jefferson fumbled the return and the Titans recovered the ball on the Dragons 24-yard line. North Oconee used seven plays to reach the end zone, finishing the drive with a 3-yard run by Marcus Alford. Despite trailing 14-6 at halftime, North Oconee maintained possession of the ball for most of the first half. The Titans ran 31 more plays than Jefferson in the first 24 minutes of the game. North Oconee picked up just 147 yards of offense in the game. Whitlock rushed for 75 yards on 24 carries. "I don't really lament the lack of scoring," North Oconee coach Terry Tuley said. "I lament taking the No. 1 team in the region and spotting them 14 points. You just can't do that, and we did." Jefferson's offense was held in check for most of the second half. The Dragons went three-and-out on their first two possession of the second half and did not put together a legitimate drive until their last possession of the game. That possession ended with Redd's 14-yard touchdown run that secured the win for the Dragons. To get his offense moving, McFerrin decided to use a scheme similar to a "Wildcat" offense, snapping the ball to Redd, who could then hand off to Minor or run the ball himself. "We've worked on that in practice for two or three weeks," McFerrin said. "We decided to put that in for the second half, and it succeeded. Darius puts pressure on the defense no matter where he is, and they had to respect that." North Oconee also changed up its offense, using a rotation of three quarterbacks - Blake Gaubert, Lane Thompson and Kevin Lowring. Gaubert did all of the passing for the Titans, completing 5 of 21 passes for 46 yards. Thompson was relied on to run the ball, finishing the game with 34 yards on seven carries. TIGER - With a dominating 36-6 win over Rabun County Friday, Jefferson - ranked seventh in Class AA polls - remains undefeated as it prepares for a Region 8-AA showdown with North Oconee next week. The Dragons (8-0, 7-0) amassed 342 yards of offense (277 rushing, 65 passing) and allowed but 168 offensive yards to the Wildcats (1-7, 0-7), who collected but four first downs. Caleb Meek led Jefferson's running attack with 80 yards and two touchdowns, and he was followed by Darius Minor (69 yards, one touchdown) and Lucas Redd (53 yards, one touchdown). Minor threw for 65 yards and a 27-yard touchdown to Cole Givens. The Dragons were led on defense by Zack Allen (eight tackles), Kyle Mosley (seven tackles), De Clark (seven tackles) and Redd (six tackles). JEFFERSON - Jefferson's Caleb Meek rushed for 114 yards and two touchdowns Friday as the Dragons, ranked seventh in Class AA, remained undefeated with a 35-6 Region 8-AA victory over Banks County. Quarterback Darius Minor posted 108 passing yards with two touchdowns, including a 61-yard scoring pass to J.J. Damons. Lucas Redd rushed for 83 yards and one touchdown. Linebacker Kyle Mosley returned to the lineup after suffering a broken leg two games into the season and paced the Dragons' defense with 11 tackles. 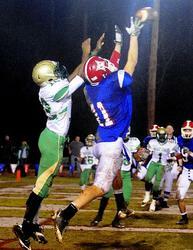 Jefferson (7-0, 6-0) will play at 7:30 p.m. Friday at Rabun County. For most of the season thus far the Jefferson football team has been perfect. But while the record will remain spotless after last night’s 27-0 blanking of Riverside Military Academy, Coach T. McFerrin has plenty to gripe about. Offensively, his Dragons turned the ball over four times, including three fumbles, while adding in a number of penalties that led to an overall sloppiness to the triumph. "I’m glad we won the ballgame, but I’m not happy how we won it," McFerrin said. "But you have to give Riverside credit they played hard. We made more mistakes tonight than we made the first five games." Jefferson came out focused and ready in the opening quarter. The defense forced a quick three-and-out, giving the offense good field position near midfield. The offensive line took control from there opening up plenty of holes for backs Lucas Redd and J.J. Damons as well as quarterback Darius Minor. The backfield trio marched downfield in 12 plays and just over five minutes before Redd finished things off with a 2-yard scoring run. The big plays on the drive came courtesy of Minor, who converted a fourth-and-4 into an 8-yard run and a fresh set of downs and followed that up with a 13-yard scamper down to the Riverside 1. Riverside’s offense sputtered again on its second drive as the Dragon defense stuffed the run. Minor’s unit got the ball back in roughly the same spot near midfield, but this time he went to the air. He found Caleb Meek on the first play for 31 yards. Three plays later, he capped the drive with a perfect pass over the middle to Hoytes Damons who made a juggling catch for a 15 yard touchdown and a quick 14-0 lead. From there, the Dragons went into cruise control. Riverside got a little something going, but its offense was plagued by its own issue of miscues and dropped passes including one sure touchdown that was dropped early in the second quarter. "I thought our kids hung in there and fought, the big thing that hurt us was not catching the football," Riverside coach Scot Sloan said. "It’s disappointing, when you get an opportunity against a real good football team to make a play, you can’t afford to have missed opportunities." Jefferson fumbled away a pair of possessions before the half, but both times Riverside couldn’t capitalize on great field position, largely because of the focus the Dragons’ defense maintained throughout the game. "The defense gave up basically one big play, but that one play was a huge momentum setter in the second half for them," Sloan said. The Dragon offense got their focus back to open the third, thanks in large part to Minor. On the second play of the half, Minor rolled left, found an opening for about 20 yards, then cut back across the field and kept on going for a 65-yard run down to the Riverside 1. Redd finished things off from there and essentially put the game away in the first minute of the third. "I was proud of the defense they got after it and played real hard. We hadn’t had a shutout all year long, and it was their time to shine and they did," McFerrin said. Jefferson went back into a lull offensively, turning the ball over on downs and fumbling on the goal line. But the Dragons were able to add one final touchdown late in the fourth as Minor finally capped a drive after getting his offense in position twice before. Jefferson will have to get back to the drawing board this week if they hope to remain perfect. "We certainly can’t win any more games playing like that, just sloppy play," McFerrin said. JEFFERSON - If automakers could invent a car that could operate as efficiently as Jefferson's first-half offense, you wouldn't have to buy a tank of gas but once a presidential election cycle. Jefferson used near-perfect offensive execution to bury Union County 63-28 on homecoming night at Memorial Stadium. The Dragons scored on seven straight first-half possessions to tie a school record for points in a game. Jefferson also scored 63 against Loganville in 1977. Jefferson's 50 first-half points were the most since tallying 50 against Towns County in 1988. Jefferson remained perfect for the season at 5-0 and in first place in Region 8-AA at 4-0. "I don't think I've ever had a team score 50 points in a half, and I've coached for a hundred years," Jefferson coach T. McFerrin said. "I think we scored every possession in the first half. But they'd go down and score on us, too. Our perimeter blocking was outstanding. Our wide receivers (Sky Porter and Tyler Porter) don't catch as many passes as they did last year, but they did a great job of sealing the perimeter tonight." Union County (2-3, 1-3 in Region 8-AA) scored on the first possession of the game. But Jefferson responded by punching the ball into the end zone on all seven possessions of the first half. The Dragons also picked up a safety and led 50-14 going into intermission. "Our philosophy on the line is to move the line of scrimmage," Jefferson senior guard Sam Loggins said. "The line's been working its tail off, so to get a night like this feels great. We really wanted to blow them off of the line and make it move backward. The backs did a great job of getting downfield and they don't need much of a hole." Jefferson's offensive line of Kevin Selleck, Kyle Mosley, Cody Berryman, Bryan Norris and Loggins plus tight ends Shaquille Maxey and Hoytes Damons led the way as Jefferson ran for 389 yards by eight different ball carriers. In the first half, 15 of Jefferson's 24 plays resulted in either a first down or a touchdown. Jefferson gained 376 yards in first half and scored on seven straight possessions. Jefferson averaged 15.7 yards a play in the first half. Jefferson's shortest gain was a 3-yard touchdown run by Lucas Redd. 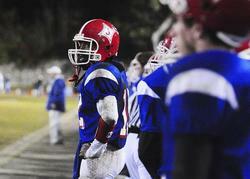 "Those holes were humongous," Jefferson quarterback Darius Minor said. "I don't want to exaggerate, but they were huge. I don't know what our linemen ate this morning, but it must have given them something extra. They've been playing great all year. But tonight they picked it up a notch or two." Minor ran for 130 yards on eight carries with two touchdowns. He also completed 4 of 4 passes for 115 yards and two touchdowns and only played two snaps into the second half. Backup running back Dequn Sewell ran for 88 yards. Backup fullback Chris Jackson ran for 66 yards. Jefferson's defense gave up some points and some yards. Union County quarterback Kolt Owenby completed 21 of 36 passes for 195 yards and three touchdowns. Receiver Blake Gowder caught seven passes for 113 yards and two touchdowns. "All week long we worried about their passing," McFerrin said. "Our scout team was able to complete passes on us, so we've got some work to do there. We weren't getting much pressure and they're too good of a passing team to do that to." The Jefferson Dragons continued their dominance in Region 8-AA, reaching the end zone on all four of their first-half possessions, on the way to a 54-14 victory over Oglethorpe County on Friday night. The Dragons established the run on their opening drive as senior running back J.J. Damons sprinted 18 yards around the right side of the Patriots' defense to the end zone. Damons finished the night with 99 yards and three touchdowns. Lucas Redd scored his fifth touchdown of the season on the Dragons' second possession, finding 4 yards up the middle to put Jefferson up 14-0 at the end of the first quarter. 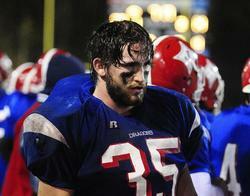 "Physically, they were just better than us," Oglethorpe County coach Larry Milligan said. "We're not gonna get as strong as (Jefferson) in three months. We'll continue to hit the weight room." Dragons quarterback Darius Minor connected with Redd for a 39-yard pass to the Patriots' 30-yard line to begin the second quarter. An unsportsmanlike conduct penalty by Oglethorpe County moved the ball to the 15-yard line. Two plays later, Damons again found running room around the right side of the defense and sprinted 10 yards to the end zone. The Dragons' final drive of the half was capped by a 42-yard touchdown run by Caleb Meek, giving Jefferson a 28-0 lead at halftime. 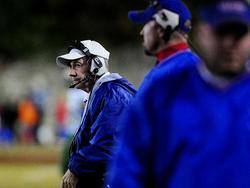 "I'm proud of the offense," Jefferson Coach T. McFerrin said. Oglethorpe ran three plays for minus-11 yards to open the second half and punted giving the Dragons the short field. Redd only needed one play to reach the end zone from 38 yards out. The Patriots got on the scoreboard with 5:17 remaining in the third quarter. Quarterback A.J. Perlotte rolled to his right and found Terrell Owen across field for a 5-yard touchdown reception. Perlotte accounted for 303 of the Patriots' 339 yards. "(Perlotte's) a heck of a quarterback. We couldn't relax. He worried us both throwing and running," McFerrin said. Jefferson's defense will see the same spread offense next week when they host Union County. "We have to get better on defense," McFerrin said. The Dragons found the end zone three more times before Perlotte scampered 24 yards for the game's final touchdown. "We don't give up and we'll fight hard. But right now, losing can be as addicting as winning, and we have to break that cycle," Milligan said. The Patriots will celebrate homecoming next Friday against Fannin County. BLUE RIDGE - Jefferson's Lucas Redd rushed for 45 yards and two touchdowns, threw a 9-yard touchdown pass and recorded 15 tackles at linebacker Friday as Jefferson, ranked No. 7 in Class AA, defeated Fannin County 42-27 at Rebel Stadium. JEFFERSON - In a span of just 6 minutes, 47 seconds in the first half, Jefferson's offense and special teams touched the ball four straight times. And those touches resulted in four straight touchdowns en route to a 56-16 demolition of Dawson County. Needless to say, Jefferson coach T. McFerrin didn't expect that kind of shellacking coming. "I was surprised," he said. After taking a 7-0 lead, Jefferson forced a three-and-out and drove downfield in six plays. Running back Lucas Redd punched in his second of two touchdowns from the 1-yard line to put the Dragons up 14-0. "I didn't do much of the work to get there," Redd said. "But I powered my way in." Jefferson forced another Dawson County punt, which was fielded by running back J.J. Damons, who darted through Dawson County defenders for a 56-yard touchdown. That touchdown was followed by a second straight punt return for a touchdown. 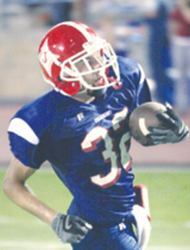 This time it was quarterback Darius Minor dodging defenders and breaking tackles 84 yards down the field for a score. "Darius is a spark plug," Redd said. "He likes to win and he likes to have the ball in his hands." On Dawson County's next possession, running back Sam Edwards fumbled on the Tigers' 31-yard-line. On the next snap, Minor scampered for a 31-yard touchdown. "We didn't want to misjudge anyone," Minor said. "But we didn't think they were that good going into the game." Minor finished the game just 3-for-6 for 36 yards and a touchdown, but added 44 more on the ground. His lone touchdown pass came at the end of the second quarter, a 19-yard strike to Damons. Minor sat out the entire second half. "I really would have liked to have played through the fourth quarter," Minor said, smiling. Things didn't get much easier for Dawson County to start the second half either. On the third play from scrimmage, Dawson County quarterback Ethan Brown threw an interception to defensive back André Daniel. On the next play, junior running back Chris Jackson took a pitch and ran the ball in 11 yards for a score. One surprise from this game was Redd, who handled kickoff duties in the first half. Redd booted five touchbacks in his first extended time at kickoff specialist. McFerrin was worried heading into the contest about running the ball. However, the Dragons ran the ball down Dawson County's throat, accumulating 176 yards, most of it coming in the first half before a lot of second and third-teamers came in. "I hoped we could run outside because we couldn't go inside," McFerrin said. "They're big up front and they have that 3-3 stack with six people in between the tackles. And we're not very big." McFerrin said he had "no idea" Jefferson would light the scoreboard up with 56 points. And he added he felt bad for Dawson County because they had a couple of key players missing this game due to injury. The Dragons are now 2-0 with wins over Commerce and Dawson County, and both Minor and Redd said, they are the team to beat in the region. But McFerrin doesn't want his team to get ahead of itself just yet. "I was worried this week because we were still on a high from beating Commerce," McFerrin said. "But I'm proud of the way we came out and played." ► TURNING POINT: Trailing 9-7 late in the second quarter, Commerce fumbled the ball deep in its own territory. Five plays later, Jefferson's Darius Minor connected with Hoytes Damons for a 15-yard touchdown. ► KEY STAT: Three Jefferson players - Darius Minor, Zach Allen and Lucas Redd - combined for 258 rushing yards. ► IMPACT: While there is no region implications with this game, Jefferson stretches its winning streak to three over rival Commerce. JEFFERSON - T. McFerrin announced his arrival, Darius Minor made his return and Jefferson extended its winning streak over its biggest rival Friday night. In the coach's first game at his new school, McFerrin and the Dragons opened their season with a 30-13 win over Commerce in the 64th edition of "The River War." The victory marked Jefferson's third straight over Commerce, the first time the Dragons have won three in a row in the rivalry since 1971. "Now I'm enjoying it," McFerrin said of his new job. "I wasn't enjoying it before. I was stressed out. I was worried about this game. It is a weight off my shoulders." McFerrin is just the third Jefferson coach to win against Commerce in his first try. The last coach to do so was Tab Gable in 1982 - his first and only season at Jefferson. Minor, the Dragons' senior quarterback who dominated the Tigers in 2008, made sure his record against the Tigers behind center remained unblemished by scoring three touchdowns. After moving the ball consistently but coming up empty in the first quarter, Jefferson's offense started clicking before the end of the first half. Minor completed his last three passes of the first half, two of which went for touchdowns. On the Dragons' second play in the second quarter, Minor scrambled to his right and launched a 54-yard touchdown pass to a wide open Tyler Porter for Jefferson's first points of the game. "I was supposed to stay in the pocket," Minor said. "That was my backside read, so I sprinted out and saw Tyler waving his hands down field. Then I just said 'Oh well' and threw it." Following a Commerce fumble in the Tigers' territory, Minor struck again with a 15-yard touchdown pass to Hoytes Damons with just seconds left in the half. Minor added a 59-yard touchdown run on a bad snap when the Dragons were attempting to punt in the fourth quarter. Jefferson's power running game set up both scores. Lucas Redd and Zach Allen continuously ran the ball between the tackles and pushed Commerce's defense line back. Allen finished the game with 91 yards on 20 carries and Redd added 72 yards on 10 carries. The Dragons' running game got its own touchdown when Caleb Meek scored on a 4-yard run in the third quarter. McFerrin wanted his offense to use "finesse," but rainstorms earlier in the day made him opt to play ball control, much to the Tigers' frustration. "They just kept the ball the whole game," Commerce coach Steve Savage said. "They kept control of the clock and their fullbacks ran the ball well." Commerce's lone score of the first half came as a surprise to just about everyone in Memorial Stadium. On fourth-and-inches in Commerce's first possession of the game, Savage opted to go for the first down from his own 25-yard line. After quarterback Cody Streetman fumbled the snap, senior Deon Brock managed to recover the ball and sprint down the field untouched for a 75-yard touchdown run. "Nah, we just fumbled the blooming ball," the coach said. "I thought maybe we were going to be lucky in this game." Brock scored again in the fourth quarter on a 3-yard option pitch to pull the Tigers within 10 points of Jefferson's lead late. That touchdown was also scored on a fourth down. As can be expected in this rivalry, both home and visiting stands were filled with many more fans lining the track around the field. Before his first game as Jefferson's head coach, T. McFerrin admitted that he was nervous about the Dragons' season-opening grudge match against Commerce. McFerrin didn't know what to expect from the Tigers, and that had even a coach with 300-plus career wins on edge. And he wasn't the only person wearing Jefferson red and blue who was nervous about the 64th edition of "The River War." His star quarterback - senior Darius Minor - was, too. "I puked before the game," Minor said after the Dragons' 30-13 win over Commerce. "I have never done that before." Minor said that he was so nervous because it was his last game against his biggest rival, and ending his career against the Tigers on a high note was important to him. The senior passed for 102 yards and ran for 95 yards, totaling three touchdowns in his final game against Commerce. In his two games as starting quarterback against the Tigers, Minor accounted for six touchdowns and helped give Jefferson its longest winning streak against Commerce in more than three decades. "He just did a great job," McFerrin said of Minor. "Even on broken plays, he makes something happen. He was great at playing the pass." Like McFerrin, Minor felt a great weight lifted off his shoulders after beating Commerce. "This just makes it complete," Minor said after the win. "It feels great, finishing with a winning record against the Tigers." Minor's winning record against the Tigers goes beyond fall Friday nights. He is also the point guard on Jefferson's basketball team, which has also dominated the Tigers. Since Minor's freshman year, Jefferson has not lost to Commerce in basketball, with the two teams playing twice a season. He has two more shots at the Tigers before he graduates. Originally published in the Athens Banner Herald on Sunday, August 30, 2009. Jefferson quarterback Darius Minor jumps out of a tackle attempt by Commerce's Tyler Adams in the first quarter on Friday. Minor passed for 102 yards and two touchdowns in the victory. Jefferson's Tyler Porter is greeted by teammate Jessie Damons after scoring a touchdown early in the second quarter of the Dragons' win over Commerce on Friday. Jefferson's Hoytes Damons strolls into the end zone for a touchdown late in the second quarter Friday at Memorial Stadium in Jefferson. 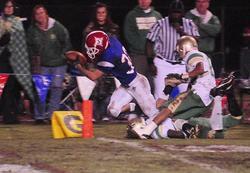 Jefferson tailback Caleb Meeks rushed for 69 yards in the Dragons 56 - 14 win over Dawson County. Caleb Meeks scores on a 25 yard option run to pull the Dragons within 10 - 6 in the second quarter against Buford. Quarterback Darius Minor rambles for 18 of his 71 rushing yards against Buford. Tyler Porter goes high for a Darius Minor Touchdown pass in the second quarter to pull the Dragons within 17 - 14 at halftime against the Buford Wolves. Coach T. McFerrin watches his Dragons battle the strong Buford Wolves at Memorial Stadium on November 20, 2009. Zach Allen ~ beaten down by the tenacious Buford defense. Darius Minor awaits a final chance to get the Dragons back into the game as Buford built up a 30 - 14 lead midway through the fourth quarter. A disconsolate Minor ( 12 ) and Lucas Redd ( 10 ) after late game fumble halted a potential game tying touchdown. 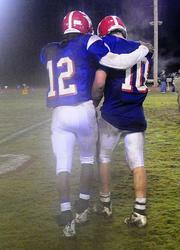 Two very good football players that gave it their all every Friday Night. Jefferson concluded an 11 - 1 season for the second consecutive season. They proved they were one of the best Class AA teams in the state. Congratulations Dragons on a GREAT season.